Who is Dr. Melissa Lockwood? Think back one year. Where were you and your practice at that point in time? Chances are, you’ve made improvements since then and have continued to learn and grow. This is certainly the case for Top Practices Marketer of the Year finalist, Dr. Melissa Lockwood. By being a part of the AAPPM, Dr. Lockwood was familiar with Rem Jackson and his work through Top Practices. She had heard how hundreds of open minded podiatrists had transformed their practices in astounding ways by utilizing the tools provided by Top Practices. Upon receiving a mailing about the 2012 Summit in Las Vegas, she decided to dive in and attend, even though she wasn’t yet a member. What Will I Learn from Dr. Lockwood? Dr. Lockwood is thrilled to be speaking at the opening session at the Top Practices Marketing and Management Summit. She will be giving a detailed talk all about ancillary services and sharing how she is promoting laser and other things to offer in your own offices. Not only is Dr. Lockwood a Summit speaker, but her practice, Heartland Foot and Ankle Associates, is proud to be competing for the 2013 Marketer of the Year title! They’ve had some impressive ideas on how to connect with patients, build lasting relationships in the community, and have a lasting impact online and with social media. They have made tremendous strides to improve their practice in just one year of being members of Top Practices. The office is running smoothly and they are seeing more patients than ever. Their presentation is truly something you won’t want to miss. Summit is a conference that is high energy and high excitement. Dr. Lockwood and her practice are excited to meet with all of the wonderful members of Top Practices. 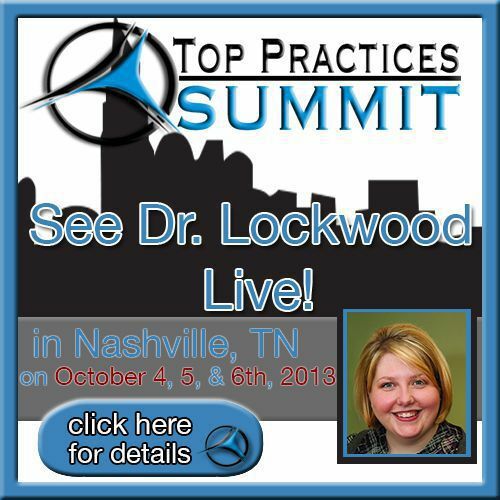 The Top Practices Summit is a chance for you to mastermind with hundreds of innovative, driven podiatrists like Dr. Lockwood. Join us October 4, 5, and 6 in Nashville, TN for this year’s conference. It’s an event that you won’t want to miss.